Gerard graduated from the University of Glasgow in 2006 and completed an Internship at Davies Veterinary Specialists. 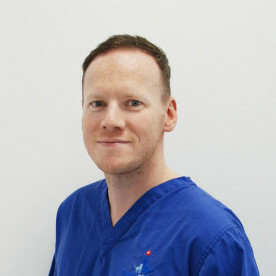 Following a short time in practice, he returned to Glasgow to undertake a three year Residency and became a European Specialist in Internal Medicine in 2011. Following Residency, he stayed at Glasgow as an Internal Medicine clinician and at the same time he established the OOH emergency service at the University which now covers for over forty local practices. He has been the Internship and ECVIM Residency Programme Director at Glasgow for the past four years. He has recently completed a twelve month Fellowship in Interventional Radiology at the Animal Medical Center in New York and is one of only a handful of Specialists in the world to have undertaken this level of interventional training. He has spoken at national and international conferences and published widely in all aspects of Internal Medicine. Gerard was recently Senior Lecturer at the University of Glasgow before joining Fitzpatrick Referrals and has a particular interest in Emergency Medicine and Interventional Radiology.